Lemon and lime. They just aren't the same. Or are they? Never gave it much thought really! Thick skin, thin skin, yellow and green, tart, sweeter, small and big. Most of us here are more familiar with the small, thin skinned ones. Lemon, oops, lime rice, lime juice, lime pickle are so much part of our culinary culture. I am just opening my eyes to lemon and lemon based desserts. When the sister visited in July, I pestered her to carry some lemons for me across the seas. Lemons of all things !? Well ! The exasperated busy doctor made a last minute trip to the supermarket to get them as fresh as she could get for me. Aromatic and bright hued, they looked gorgeous indeed! Wish they were as commonplace here as well. Snugly wrapped in cling film, they sat in the fridge much longer than I meant them to. Worried they might lose their charm, I hastened to make some Lemon Thins from my favorite cookie book Chewy Gooey Crispy Crunchy Cookies. In contrast to the much smaller thin skinned ones we get here, the lemons gave their zest and juice so generously! Times when I wish I had more than just a passing interest in gardening! These cookies, Medrich claims, are more lemony than most. 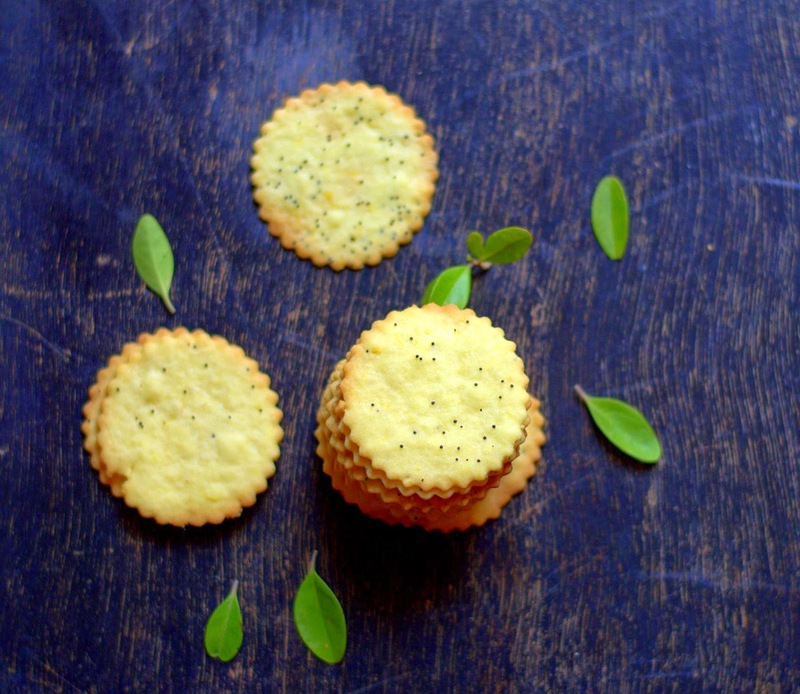 The recipe is from her friend Maya Klein, hence the name Maya's Lemon Thins. She reduces the lemon juice, concentrating the flavor, thereby producing buttery, tender-crisp thin cookies with a pleasant lemony taste. If you love all things lime and lemon, you must give these a try! I made these with lime as well and they taste just as good, but be sure you use the freshest and best you can find. Ingredients : To make sixty-four 2 1/2 inch cookies. Method : Mise en place. 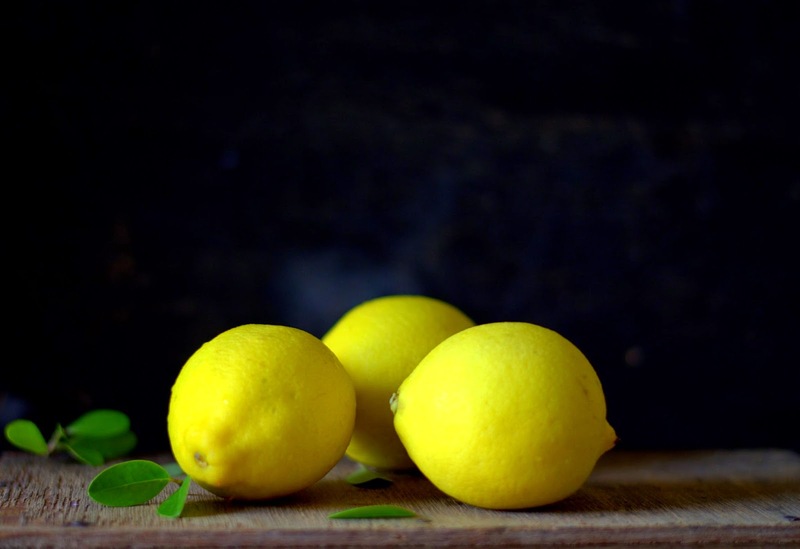 In a heavy sauce pan, heat the lemon juice on medium heat till it becomes thick and syrupy and reduces to 1 tablespoon. This will take hardly anytime, so stick around. Measure it sooner than later, you can always put it back on heat to reduce further if needed. Turn off the heat. Add the butter, stir till it melts. I have cooled this and then whisked in the zest. In a medium sized bowl, whisk together the egg, egg yolk and sugar till homogeneous. Whisk in the butter mixture. I find my tiny whisk very handy here. Tip in the flour. Using a spatula, stir until just incorporated. The dough will be very very soft. Wrap it in clingfilm and refrigerate at least 20 minutes. Once you refrigerate the dough, you can store it for up to 2 days. The dough will firm up. You want it firm enough to roll out easily without it being too hard. If you refrigerate longer, keep portions of the dough out at room temperature till it is fairly firm, but soft enough to roll easily. (After the first 20 minutes of chilling, Alice directs to divide the dough into 4 portions, roll each piece 1/16 inch thick between 2 sheets of plastic or wax paper. Slide a cookie sheet under each plastic sheet, refrigerate till firm, cut and bake) Since I found the dough too tender to to do this, I have divided the dough into smaller portions and rolled out the chilled dough. Line 2 cookie sheets with parchment. Take out one small portion of the dough from the fridge. Lightly dust your counter. Carefully, roll the dough thin, about 2 mm. Cut the cookies with a 2 1/2 inch cookie cutter. Transfer the cut outs to one sheet, chill briefly (about 20 minutes) and then bake them on another lined sheet. I find my large and small metal dough scrapers very useful for lifting the rolled dough and transferring the cookies to the sheet. Re-roll scraps. When ready to bake, pre-heat oven to 200 C / 400 F. Carefully transfer the cookies to the lined sheet, spacing them 1 inch apart. Bake for about 6-7 minutes or till golden around the edges. Watch carefully as they burn quickly. A test batch will tell you the exact baking time. Cookies crisp up as they cool. Can store the cookies air-tight for at least a week. The dough freezes well Alice says, which is an added bonus. 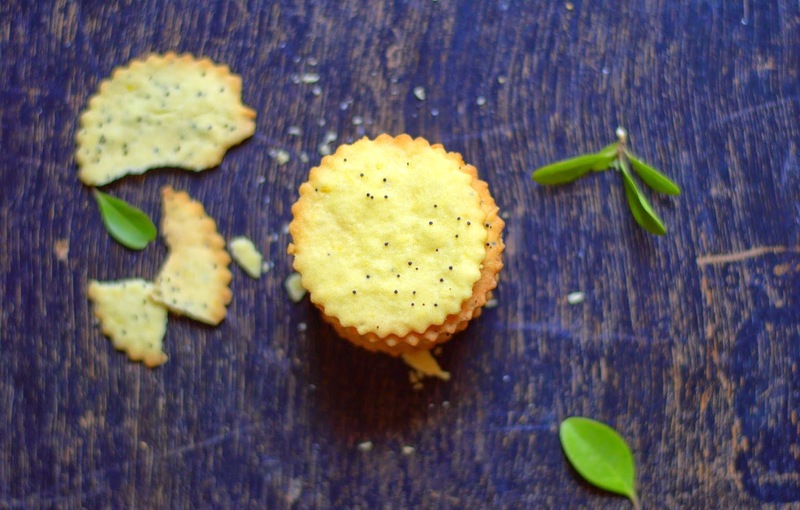 Lemon Poppy Seed Thins : Add 1/4 cup of poppy seeds to the flour mixture. Lemon Ginger Thins - Omit the lemon juice and the boiling step. Melt the butter and add 2 tablespoons finely grated ginger. Mix one teaspoon ground ginger with the flour and baking soda. Proceed as directed. Dainty, crisp and lemony, don't you want these in your cookie jar? Awee...I can almost smell the delicate lemony flavors of these beautiful thins! Perfect shapes and lovely presentation, Suma. the cookies looks so delicious and yummy. Cookies look quite tempting Suma! Very detailed post as always. :) I still have the same question, where do you get these black poppy seeds from? Do we have any place here in Bangalore? Looks superb! They just dragged me from gawker here! Would love to try that ginger version. @ The Posh Nosh - Thank you! You can get poppy seeds at wholesale dry fruit shops. I got from a shop on Avenue Road called AB General Stores, opposite Jauhar Bazaar.